Digital UltraViolet and Digital Copy will makes it possible for you to stream the movie Super Troopers 2 HD UV Code instantly to your computer and compatible Smartphones, Andriod, iphone, iPod Touch, iPad and tablets devices anytime, anywhere. 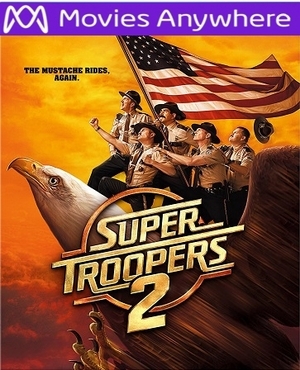 You can also download a Digital UltraViolet Copy or a Digital Copy of the movie Super Troopers 2 HD UV Code to your computer and compatible devices. Super Troopers 2 manages to escape the curse of comedy sequels made several years after the original and is a funny little film and probably Broken Lizard's best since the original. Now, whether it is as good as the first one? I'm afraid I really can't say since its been so long since I've seen the original. Now, this isn't is a perfect movie. As mentioned, the jokes are hit-and-miss. For instance, the second half of the opener is really funny but the first half is weird and the most awkward part of the film. As with most Broken Lizard movies there are a fair share of jokes that only appeal to teen boys or frat bros and those that were probably just funny only to the Broken Lizard guys (like the entirety of Club Dread. Remember Club Dread? What were they thinking?!) Also, there are some jabs at Canada that were just super lazy. I'm not saying this from a PC-perspective: the jokes were super weak as jokes in general. There is a brief scene where one character says something in a stereotypical Canadian way for a very brief moment and all the cops around her laughed good-naturedly. That whole scene just felt super-forced like the creators were insisting upon themselves. Overall, a funny film but not one you have to rush to see.